In the 1990s, long before the trombone-driven rock of Bonerama became part of the evolving fabric of modern music in New Orleans, Mark Mullins, one of that band’s founders, and keyboardist and vocalist John Gros, formed MuleBone. Gros would go on to form Papa Grows Funk and also take his place in the New Orleans musical pantheon. MuleBone, recorded two well-received albums and slowly faded as the musicians’ other projects came to dominate their careers. Mullins and Gros, along with guitarist Jimmy Robinson and drummer Mike Barras, mainstays of the group’s short but acclaimed tenure, will reunite for one night only at One-Eyed Jacks to celebrate the re-release of MuleBone’s two albums. 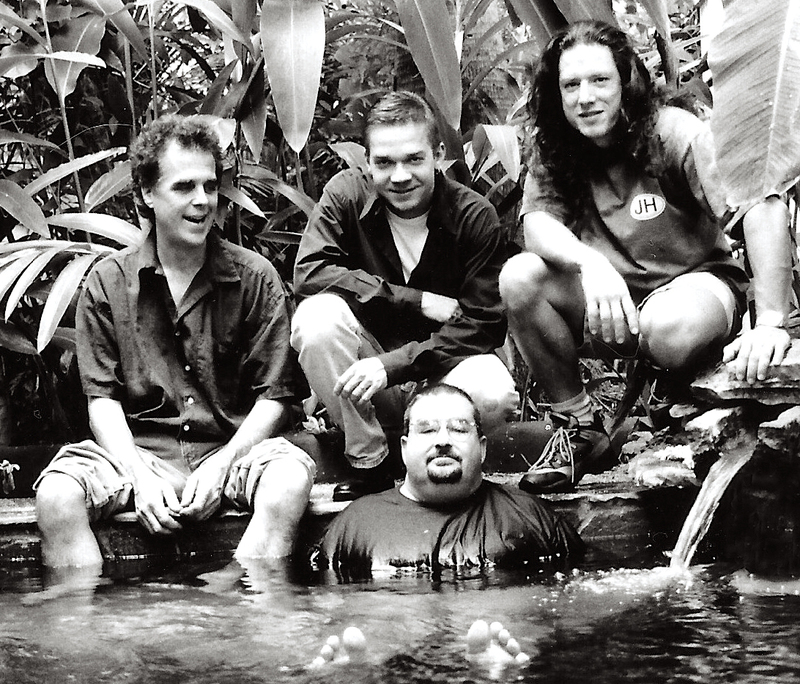 (The publicity photo below was taken during the recording of their debut in 1998.) Like many bands that begin and develop in New Orleans, numerous musicians rolled through the ranks. Dave Pomerleau of Johnny Sketch and the Dirty Notes will play bass on Friday night. 2018 marks the 20th anniversary of MuleBone’s award-winning debut album 5 Shakes, 7 Spirits. A year later, the band swept the ceremonies of the city’s two music-awarding publications winning “Best Rock Band” at Gambit’s Big Easy Awards and OffBeat magazine’s Best of the Beat. OffBeat readers also honored the group for “Best Rock Album.” In 2001, MuleBone released their follow-up album, Only in New Orleans. By that point Gros had amicably left the group to focus on Papa Grows Funk. Both Mullins and Gros were already seasoned musicians before forming MuleBone. Mullins was on the road with Harry Connick, Jr. and Gros was a member of George Porter, Jr.’s Running Pardners. Jimmy Robinson has fronted his progressive rock band Woodenhead since 1975. Barras was a journeyman player back in the day and has been with fiddler and vocalist Amanda Shaw for over a decade. The two albums stand the test of time from both a production and songwriting perspective. The musicians are older and arguably better players, so I believe that the show will really rock. They are expecting several of musicians who cycled through the band in its early days, and after Gros left the group, to appear. The Breton Sound opens. Showtime is 10 PM.